3 DIY Halloween Looks For Under $25! You could click "buy" on that too-expensive, prefab Lycra costume online — but, really, where's the fun in that? For DIY enthusiasts like yourself, Halloween is practically the Superbowl, where the craftiest among us get to show off our wit (not to mention poster-paint skills) on a homemade disguise that's a million times more creative than anything from a big-box shop. 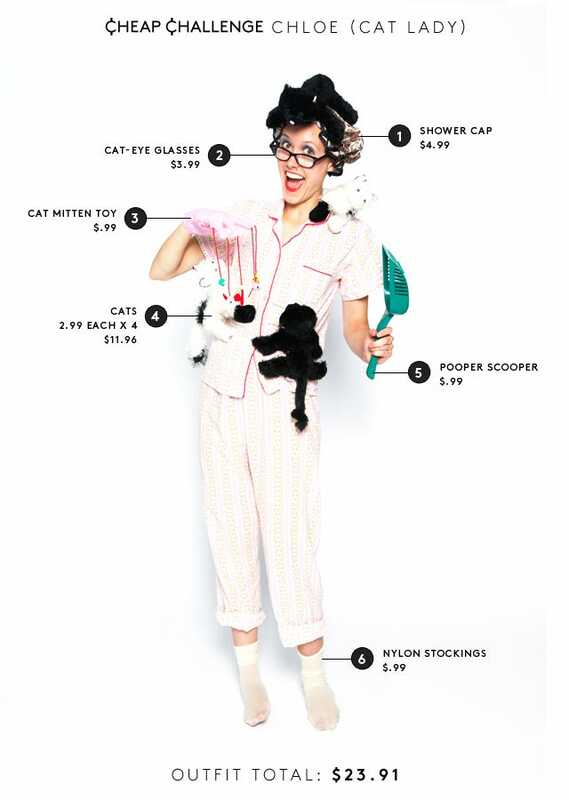 To showcase our own skills — and serve up some inspiration — we gave three of our editors $25 and asked them to hit The Dollar Store, KMart, and Walgreens to put together a one-of-a-kind costume. So, even if you're still at a loss for how to hit it out of the park this Thursday, maybe it's time to make a trip to your local strip mall — after all, Halloween on the cheap doesn't have to be so scary. Photographed by Erin Yamagata; Designed by Ammiel Mendoza. "I'm actually not the biggest fan of felines in general, but who doesn't love a crazy cat lady? I attached some adorable kittens (Fifi, Sophie, Anastasia, and Pepper) on my pj's with safety pins to make all of us truly inseparable, and they had such a good time on the photo shoot. 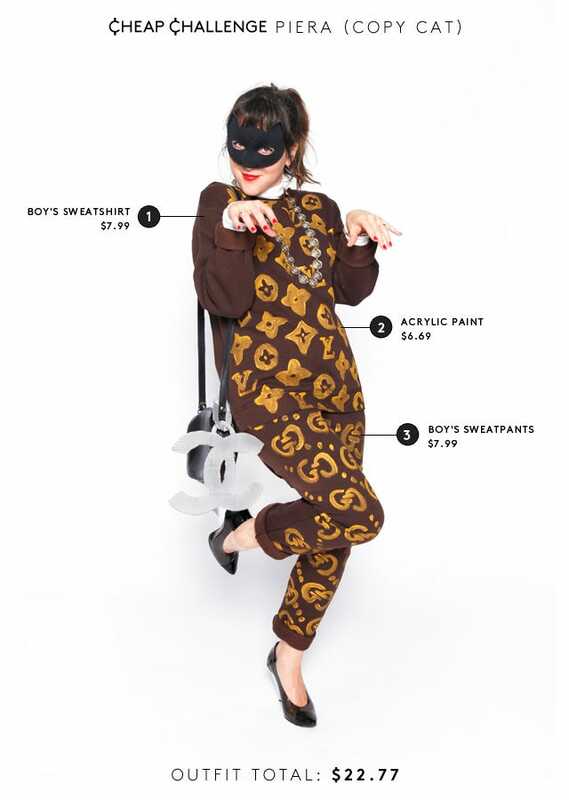 For anyone looking for an easy costume, this is definitely it." "I had assumed that it'd be a cinch to find a costume at Walgreens, but I didn't realize how expensive things could be! I had so many ideas, but all of them went well over the $25 mark (Plastic umbrella + pink crepe paper = jellyfish! Laundry hamper + styrofoam balls = mints dispenser!). 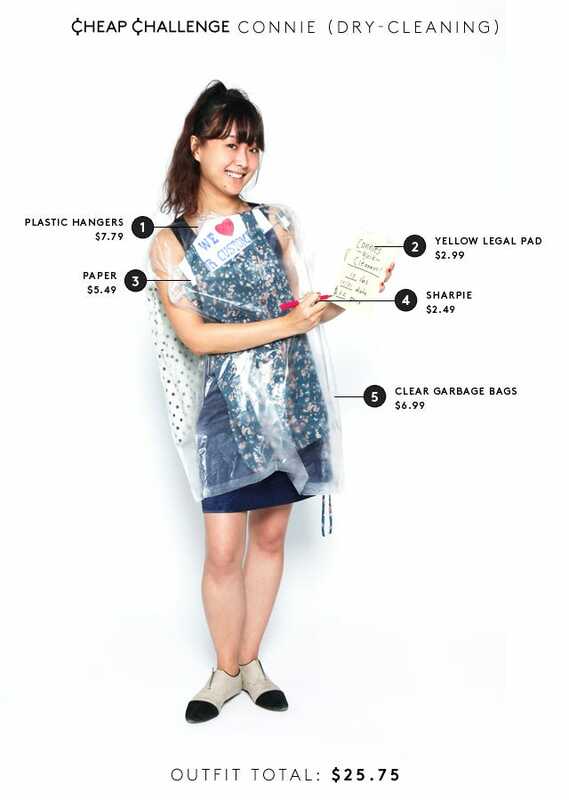 Using clear-plastic garbage bags (mandatory now for recycling in NYC! ), hangers, copy paper, and Sharpies, I fashioned a dry-cleaning kit. I wore my only 'going-out' dress with it and attached one of my own silk tops and polka-dot blouses to the back. Of course, I couldn't forget to make my own yellow slips. If I was single, this would be the perfect flirtation tool — write up a ticket and offer it up to your boo of choice: 'Don't forget to pick me up this Saturday!'" "Inspired by Canal Street and the resurgence of major logo branding on the latest runways, my initial idea was to go as a cheap knockoff. I thought it would be funny to wear all brown like a leather handbag and hand-paint myself with luxury logos head to toe. I cut the giant Chanel logo out of a cardboard box to create an oversized key chain, and when rooting around for accessories to wear with the costume, I found this old chain belt that felt very Versace to me as well as a cat mask in my closet — which gave me the idea of adding a pun to the mix (which I feel always makes a costume even better)."